Gary Busey dodged termination again! He's like a cat with nine lives. Even though Latoya Jackson did a disjointed job as Project Manager for Team A.S.A.P., the men wound up losing the task. Project Manager for the men was Mark McGrath and it came down to a showdown between McGrath and Busey in the boardroom. Celebrity Apprentice 2011 fired Mark McGrath and Gary Busey survived for at least another week. This week's task was for the teams to create a theme in a 10' X 10' cube and an external interactive experience outside of the cube for Australian Gold suntan and skin care products. Judging was done on the standard criteria whenever a product is involved - How well does the team grasp the brand and the brand message? From the beginning, Latoya Jackson seemed lost leading her team. All of her decisions seemed to be made on the fly, but in the end the women produced a good enough theme and experience to win. Their cube was a beach scene with the slogan, Living The Gold Life. It featured male and female models in swimsuits painted in gold. Lounging in a beach chair, the female model was fanned by the male model. Outside of the cube, the women had a volleyball net and some fake snow, showing how the suntan products could be used for winter sports, too. One of the big elements that helped seal the deal for the women was Nene Leakes dressed as a Koala, one of the central images used in the Australian Gold logo and brand. Keeping with tradition, the men took a risk and took a big leap outside of the box. 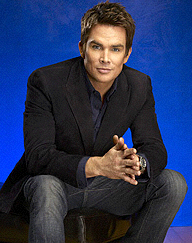 Mark McGrath came up with a pirate theme where the Australian Gold product would be featured as the treasure that the pirates had to offer. McGrath's pirate theme is what eventually proved to be his undoing. Lack of a Koala at the men's exhibit was also another point the suntan execs did not like. Lot's of drama was provided by Gary Busey throughout the show. When the men met with the Australian Gold executives - a man and two women - Busey said, "Your product makes me feel sexual." Afterwards, the men couldn't believe that Busey basically said the suntan products made him horny. Busey also enraged his team members when he grabbed the suntan execs at their exhibit and started pitching them on their product. Busey wouldn't let anyone else talk to them, including Project Manager Mark McGrath. Gary really went off the deep end when he pitched himself as a company spokesman for Australian Gold to the confused executives. In the boardroom, Latoya Jackson received plenty of heat from Nene Leakes and some negative comments from the other team members. But the women won and she was saved. When the men were questioned after the women left, everyone tore into Busey. He denied everything they said about him. McGrath made a fatal mistake when he said that he would take full responsibility for the loss because he picked the pirate theme that was highly disliked by the Australian Gold staff. Donald Trump asked McGrath to bring back two other team members to the boardroom. McGrath said that there was only one person he wanted back in the boardroom with him, Busey. As Trump grilled the two, he kept going back to the fact that McGrath had felt that he was responsible for the loss. Although, there were some tense moments for Busey. In the end, Celebrity Apprentice 2011 fired Mark McGrath and Gary Busey survived. Busey's close call was capped with a warning from Trump, "Gary, you better straighten up. You have to watch what you say, who you touch and what you do." Busey's survival may have been done for ratings. Busey is a nutcase and everyone wants to know what he's going to do next. Let's see if he can survive next week. Preview of April 10th show: Celebrity Apprentice 2011 | Who Will Be Fired April 10th?